Over time the brake calipers may cease to retract sufficiently causing wheel rotation to drag. 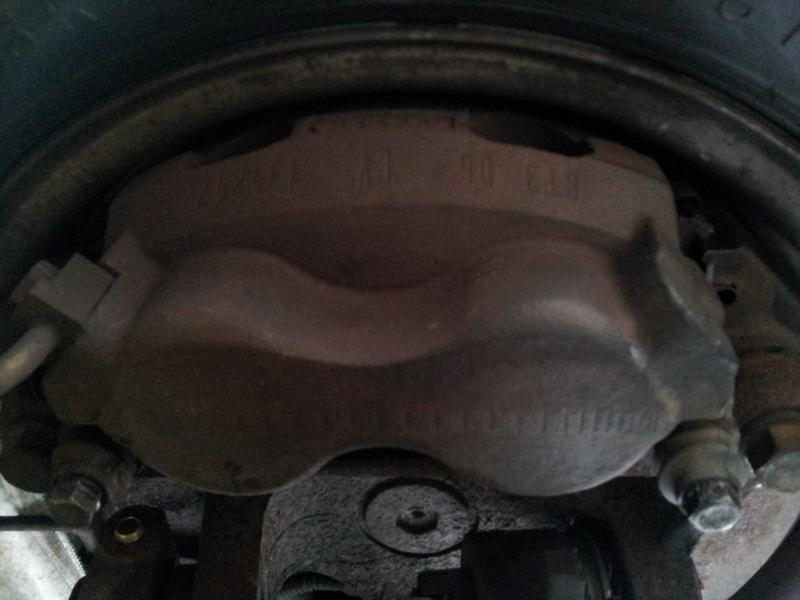 This can cause a squeaking sound while driving, in our case between 25 - 35 mph that ceases when you apply brake. The mechanics a Defuniak Springs (Google sent us in the wrong direction for 10 miles), thought that brake dust combined with the exceedingly dry weather might exacerbate this issue. One approach is to take the brake mechanism apart and clean it. Another, replacing the whole thing. Remove, inspect and lube the caliper glide pins is also suggested and we took it one step further to spray a small amount of penetrating oil onto the bottom and top slide rails that we suspect might be the source of the dragging. Other information we know from the day is that the brake caliber piston, as it extends further due to the pads becoming less thick may increasingly be less prone to retract. Though the pads are still good, the over extension of the piston might be causing alignment issues that prevent retraction. Another typical symptom of caliper drag is a pull to the left or right, especially off of a start. Ours is still tracking well though they noted drag on both wheels. Our caliper glide pins were in really good shape, the lower right one had some de-lamination of the polished finish. We wiped them clean, greased and re-installed. J&J Installed New front tires Michelin XPS Rib, Big Truck service tires on all 6. Quieter than combination tires. We mark and take note of where the balancing weights are. Having lost one it would be good to know their values and locations. 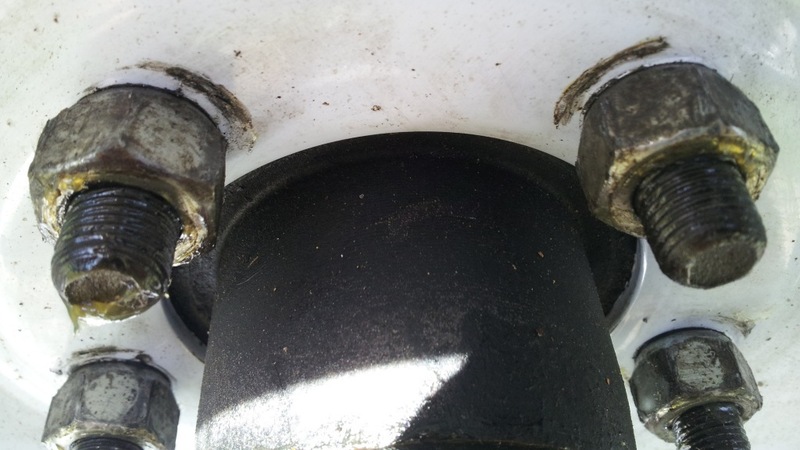 All 4 ball joints on the Ford E-350 front end had wear. These are the major structural connector of the rotor/wheel assembly to the rest of the suspension. With the front end propped up, using a big bar under the tire, the mechanic was able to demonstrate the up and down play going into the ball joints, there should be little or no play. This type of wear is common to the vehicle. 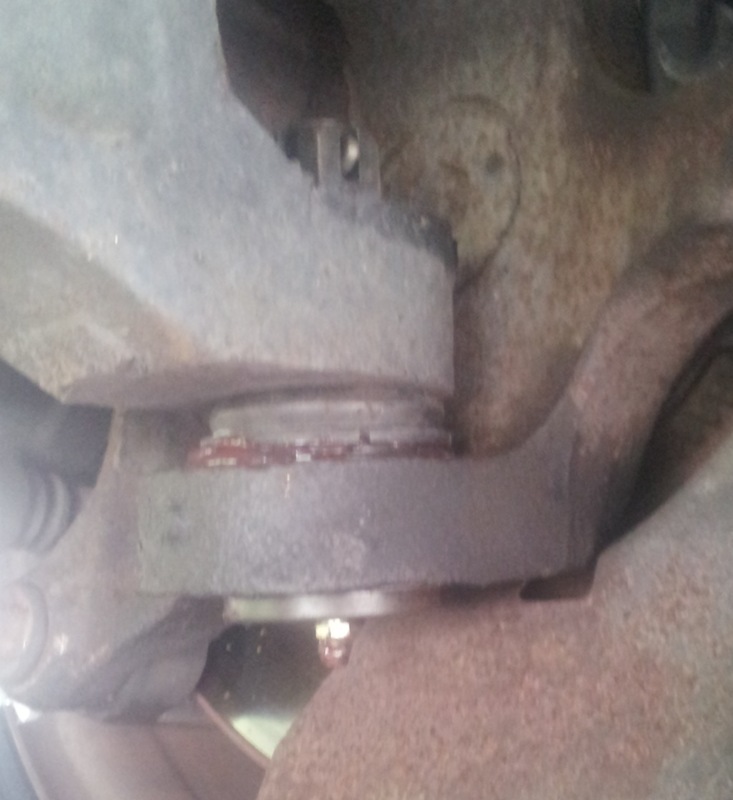 Did the once bad shocks transfer vibration into the ball joints causing them to wear? 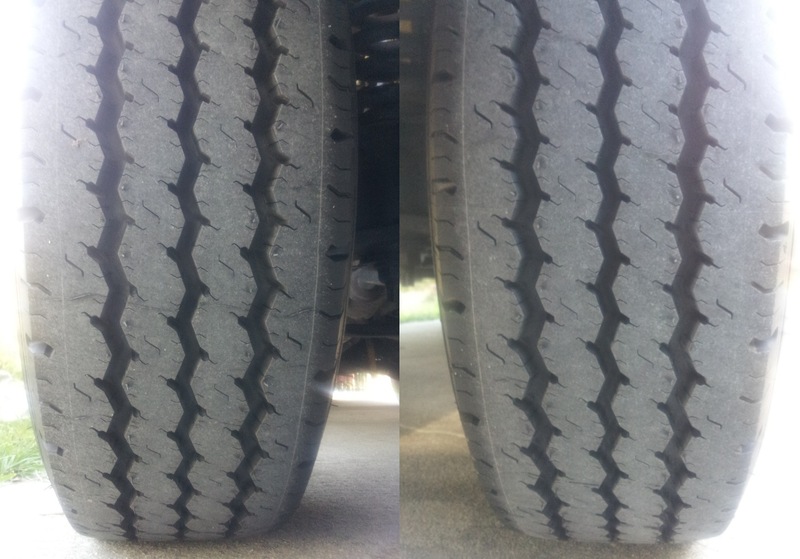 The Utah replaced front tires are now showing signs of uneven wear. The right front outside edge is wearing out faster then the inside edge and the other tire and approaching the warning track. Pattern wear on this tire is not normal especially in comparison to the other. Alignment? The vehicle travels straight on a flat road with hands off steering wheel. 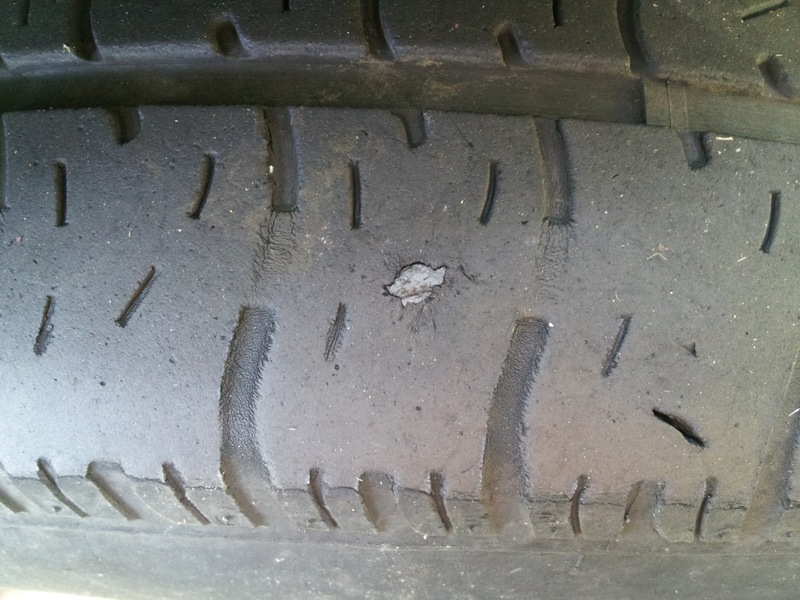 The original tires wore out prematurely having become "cupped", causing bad vibration. We replaced these while on the road. The mechanics said bad shocks caused stress on the vehicle's suspension and would cause problems. We had the shocks replaced. Now way before even the nominal 20 K miles one can expect from combination tires these are done. Front end alignment terminology. With properly aligned wheels tires last longer, easier steering, better gas mileage, smoother ride and less influence from passing trucks. 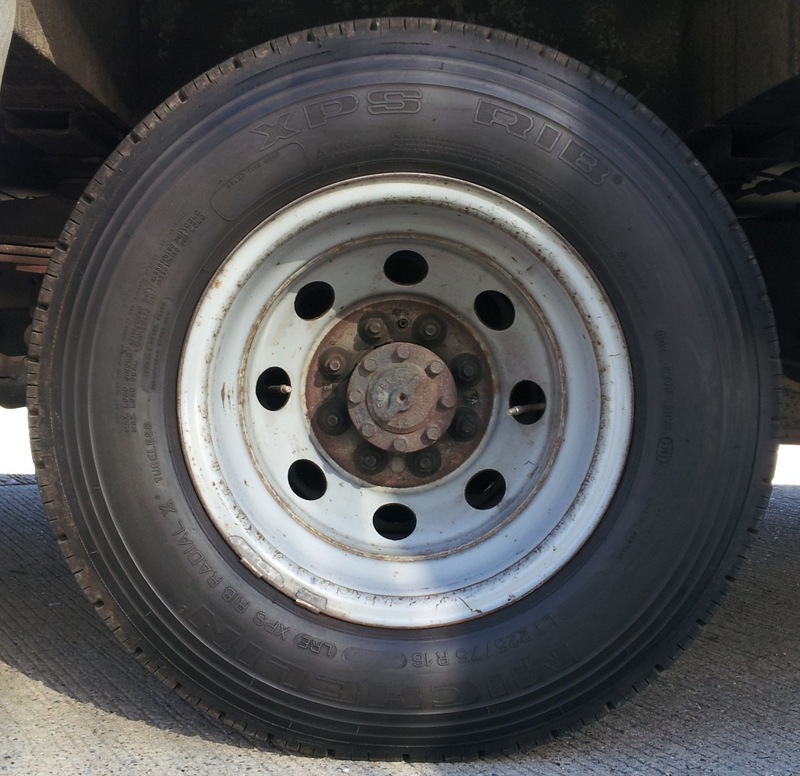 Trailer tires and wheels are not built to the same specifications as automobile tires. "For trailer service only" is what you might see on one and means they are built to lesser standards. We always opt to use automotive tires when possible. Some trailer sizes are hard to find. The service industry does not believe in balancing trailer tires. I had to insist to have mine balanced. As RVers we find it beyond belief that there exists separate, lesser standards for trailer tires as there are for Automobile tires. We know that wheel separation usually occurs within 300 miles of the tire being remounted. Without having a complex array of sensors on every truck it is impossible to know what causes this to happen. Usually a tire shreds before metal bolted to metal separates. Upon re-mount, radial forces going into oblongment of the tire (cupping) create greater forces on the wheel to hub connection, usually held in place by the clamping force. The tire might shred. However addition of lateral forces (from end play) reduces the clamping effect momentarily per each rotation of the wheel. The post-remount increased radial force briefly overcomes the clamping force and works directly on the studs causing them to shear or the connectors come off. Commercial truckers after the spate of incidents in 1991 and new industry guide lines for increased diligence speak of looking at wheels and studs for cracks, wear, rust or separation. The hand test is to simply put your hand on the tire, it should be warm. Hot would indicate loss of bearings or axle oil. Look at where the nut goes into the wheel. It is possible to see when a nut is not deeply seated enough. Refers to the amount of play in the tire given the shake test. Usually between 1 and 5 thousand's of an inch. Methods of bearing installation going into pre-load such that the tire is tight on the hub and unable to wobble which speaks primarily to uneven tread wear. 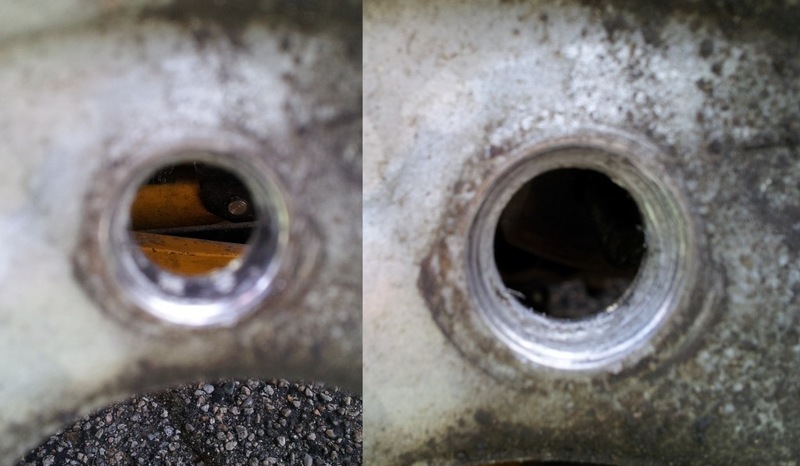 After removing wheel, the surfaces should be cleaned with a wire brush for good re-contact. Aluminum wheels are especially prone to coming loose. Good shops recommend returning for a re-torque after 15-500 miles some require initialing. 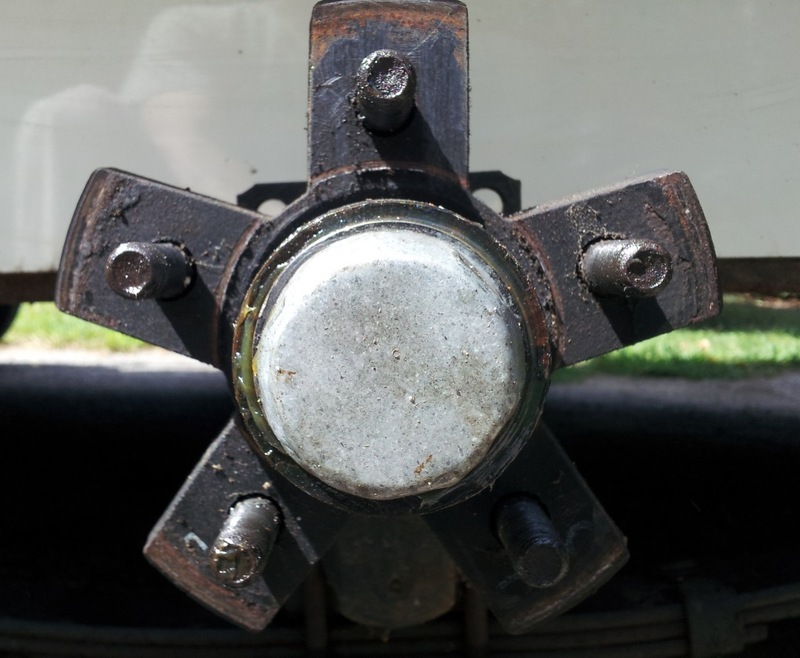 Wheel separations can occur from axle failures, hub failures, or fastening failures: most common - when the nuts on the ends of the studs un-thread and fall off [typically on left-side wheels], or when the metal wheel studs break off [typically on right-side wheels]. For both a loss of clamping force is the culprit (corrosion, wear, aluminum). Some of the above comes from MEA Forensic where Mark Baily discusses the science. What I don't see addressed is what possible cause could excessive vibration play? 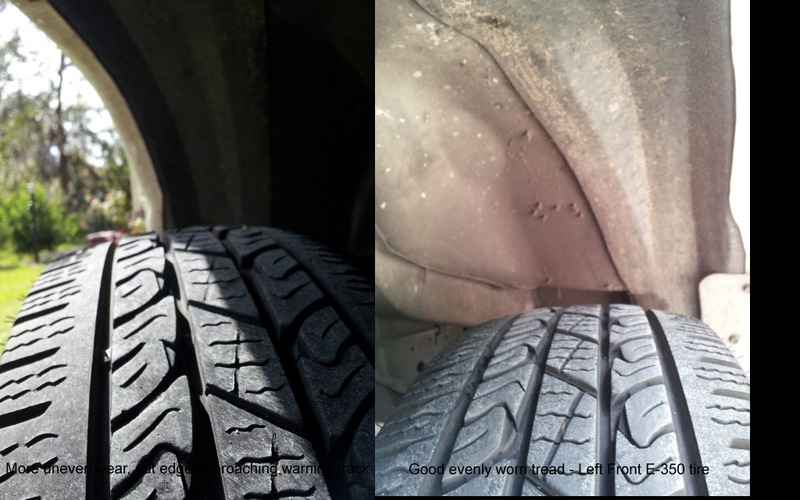 Some of us understand that vibration can cause anything to become fatigued or loosen and wonder what part lateral vibration in tire rotation (e.g. Balancing issues) could play. RV tires For most 5-7 years or 30k miles. Most tires are of blocked pattern, true ribbed equals long milage, low noise highway tires like those on bigger trucks are few in between. Blocked tires typically are good for 25,000 miles max. 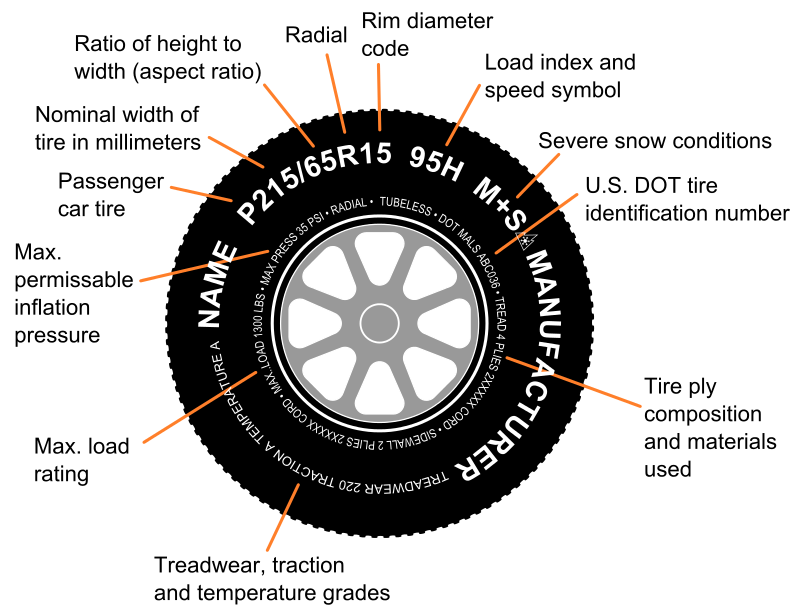 Did you know that the tire's light spot is identified and marked during manufacture so that the tire shop can install it at the wheel valve assembly (known heavy spot) thereby offsetting or minimizing the unbalance of the assembly. A true dynamic balancer will spin the wheel/tire to highway speeds while sensing both the lateral and vertical forces generated allowing for the assembly to be balanced in both planes. 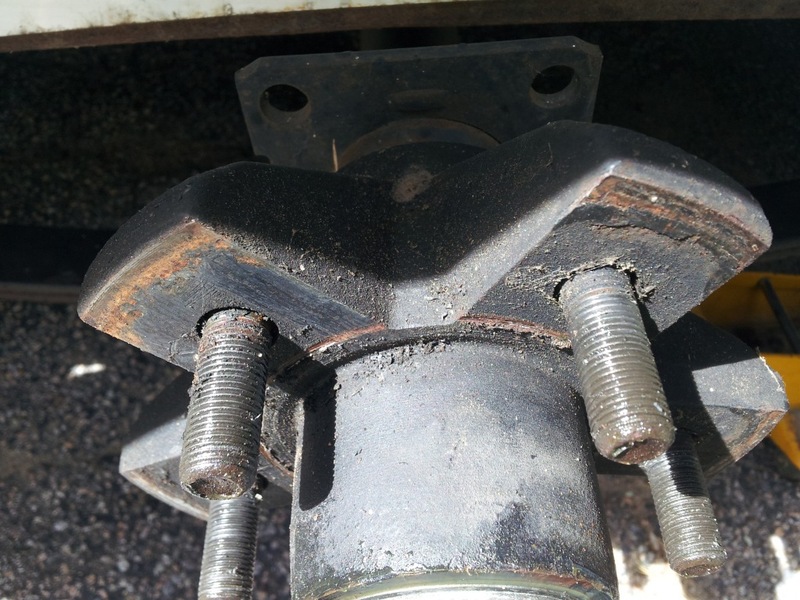 Note, that a modest lateral force may never even be noted by the driver but can do great damage (wear) to the suspension components of the RV. After mounting the new tire and wheel, check for RUN-OUT. If your installer has a run-out gauge (ex. http://klineind.com/at32000.html) If over .035" run-out correct it by rotating the wheel on the hub. Loosen the lug nuts with the point of most run-out at the top and let the few thousands of an inch play work to your advantage. If that doesn't work have the tires trued. There are still a few shops that do tire truing. A true round tire will last a lot longer. Acceptable measurements range from 0.000 to 0.060 - "I have measured the run-out of hundreds of new Michelin Tires and have never experienced a run out of more than 0.040 in a properly mounted assembly"
Single 2680 lbs (1215 kg) the 115 rating see: Tire Codes for more info. Also called tire tread designs, tire tread patterns are the arrangement of continuous ribs, independent tread blocks, circumferential and lateral grooves, as well as the thin sipes molded into the tread to fine-tune noise, handling, traction and wear. Tire treads patterns feature different basic designs to help them meet anticipated driving conditions. A symmetric tread pattern is the most common and features continuous ribs or independent tread blocks across the entire tread face where both inboard and outboard halves feature the same pattern. Tires featuring symmetric tread patterns allow using multiple tire rotation patterns. Asymmetric and directional tread patterns have v-shaped tread grooves that are offset compared to the centerline of the tire. Tires featuring asymmetric and directional tread patterns must be treated as directional tires for tire rotation. However, if different tire sizes are used on the front vs. rear axle, they become location-specific and prohibit any tire rotation possibilities. Grand Touring tires and others with asymmetric treads will usually be the quietest, while high-performance directional treads are generally louder. The most common noise produced by tires is tire pattern noise. Pattern noise is what people usually are referring to when talking about tire noise; it occurs because air is trapped in the tread pattern and is suddenly released as the tire rolls along the road surface. Tread elements successively hitting the road surface can create what’s known as a rhythmic percussion. Tread designs made up of short, repetitive patterns often generate a whine. Usually, a tire with a rib tread pattern is much quieter than a tire with a lug or block tread pattern. Tires running higher inflation pressures generate lower noise levels compared to those with lower inflation levels. Radials are much quieter than bias tires, and high speeds result in more noise than lower speeds. Tires with the same size tread segments all around the circumference of the tire (a single pitch pattern) tend to create significantly higher noise levels than tires with tread blocks of varying sizes and shapes (a multiple pitch pattern). While the multiple pitch patterns each produce different pattern noises, the overall noise level is much lower. Reducing tire noise by varying the tread pitch pattern is a complicated process. At a minimum, there must be several different pitches placed around the circumference of the tire. But it requires more than simply making several different tread pitches. Tires get noisier as they wear because of their construction, tread design and uneven wear. As a tire wears and the thickness of the tread and its sound insulating properties are reduced, it gets closer to its belts and reinforcements – this can increase tire noise. Directional tires often get louder as they wear; much more than non-directional tread designs. Tires that are allowed to wear in an uneven manner produce more noise and even steering-wheel vibration. Proper tire rotation and wheel alignment are critical to avoiding such problems, especially with directional tires. Michelins some awesome some not so well receieved, when more than one comment complains about lack of milage. http://www.tirerack.com/tires/tires.jsp?tireMake=Michelin&tireModel=XPS+Rib∂num=275R6XPSR Michelin Summer Rib $270 long tread life unanimous comment consensus, stable, track, quiet. Cover when parked! A serious looking Truck tire in LT size range. Noe it is 40 lb instead of the usual 32 for tires of this size, another talks of stiff sidewalls. Bridgestone Duravis M895 also makes a Summer Rib tire but not well reviewed. "fuel light used to come on around 325-335 miles, now its 290-300. Mileage average was 18.1mpg on old tires hwy/city, now 17.3mpg. Hankook VS previous set" ? Stiff sidewalls, loud? Snow Tires are for pushing through snow. Some snow tires can't do that. All Season tend to be warm and rain, snow is a special application requiring two sets of tires. Goodyear: G949 RSA Amor MAX Over $300 is likewise another ribbed tire contender. "Cupping" or the tire developing flat spots. This is characterized by a shuffing sound most often heard while lowering speed toward a stop. The tire, coming out of round either due to out of balance, under-inflation or general manufacturing processes is generating more noise and evidenced by irregular wear patterns or cracks. Unfortunately even though their appears to be good tread, the tires are increasingly shot and need replacement becoming a blow-out hazard! Below we have a new Michelin Defender and a cupped Bridgestone with crack. Big Rich's rear tires were loud. Later I noticed that some of the blocked tire patterns were black (most were whitish - the back ones were not coming in contact with the road) and was almost impossible to see the cupping. But it made that shuffing noise. Then I noticed the crack. Literally the tire in the process of coming apart. Another incident, we were asked to take the park truck out on the highway and I heard that noise. Though the Truck size USA made Goodyear Wranglers hang tough, after 35 - 40 K miles they start to cup. Upon inspection these had sure visible signs of cupping. We refused the truck.